Fall is in full swing in the Pacific Northwest, and at Standard Bakery we are excited for the coming holiday season and forthcoming changes in the new year. If you've been following our news recently you know that we succesfully completed a Kickstarter campaign to open Zylberschtein's. After we help you indulge in pie for Thanksgiving: Apple Pie with Oat Crumble, Honey Pecan Pie, our Classic Pumpkin Pie, and our new Blueberry Rhubarb Pie, and Cookies during the Winter Holidays, we will be closing for a short time in January to remodel our space into a Jewish Deli. Don't worry, we will still have all the pastries you've come to love from us - flaky croissants, rich and buttery cookies, our tangy sourdough, our chewy bagels, and our tasty breakfast sandwiches. We will just have more on our menu. In the meantime, sit back, relax and let us help you with your holiday baking. Starting November 1st you can order fresh baked pies from us along with our new Parker House rolls, and our sourdough breadcrumbs for stuffing for your Thanksgiving feasts. And, if you want to start thinking about Hanukkah and Christmas early we already have our Winter Holiday Menu set. We are bringing back our much loved Holiday Cookie Box, our Gingerbread House Kit and our hand-decorated holiday cookies. Our full menu is attached. Place your order by calling the bakery at 206-420-4354 or email us your order. 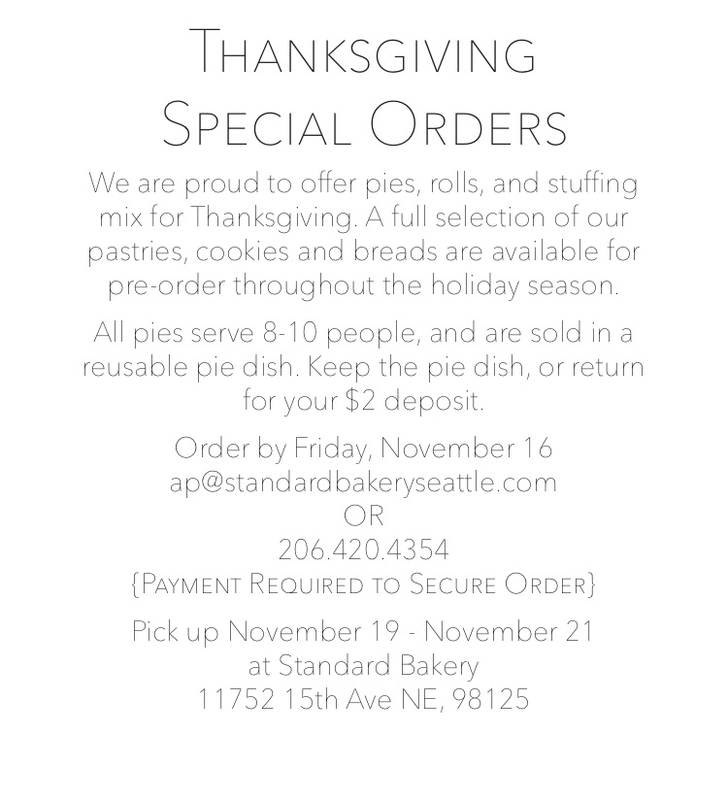 Thanksgiving orders must be placed by Friday, November 16th. All pre-orders must be paid in advance. After you place your order we will send you an email invoice for your order; once the invoice is paid, your order is confirmed. As always, thank you for being such wonderful customers. We appreciate your support and hungry bellies!